What does a farm share cost? Our early season boxes contain a nice mix of greens, bunching onions, fresh herbs, sugar snap peas and cucumbers out of one of our high tunnels. Salads and stir-fries are abundant from these first four or five boxes of the season. 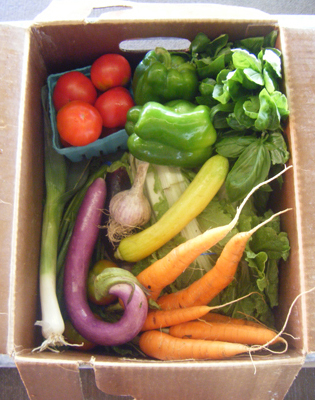 Our mid-season boxes start to see more variety as we move from spring greens to the early summer favorites of carrots, green beans, zucchini, beets, cabbage and the first new potatoes dug shortly after the fourth of July. By mid to late July we start to see the arrival of some of the heat loving crops such as tomatoes, peppers, eggplant, and onions. Our fall boxes are heavy with a nice variety of root crops such as carrots, beets, and potatoes, three-or-four types of winter squash, and the tender and sweet fall brassicas, broccoli and cauliflower. In addition to these favorites we see the return of a variety of greens such as chard, lettuce and spinach.